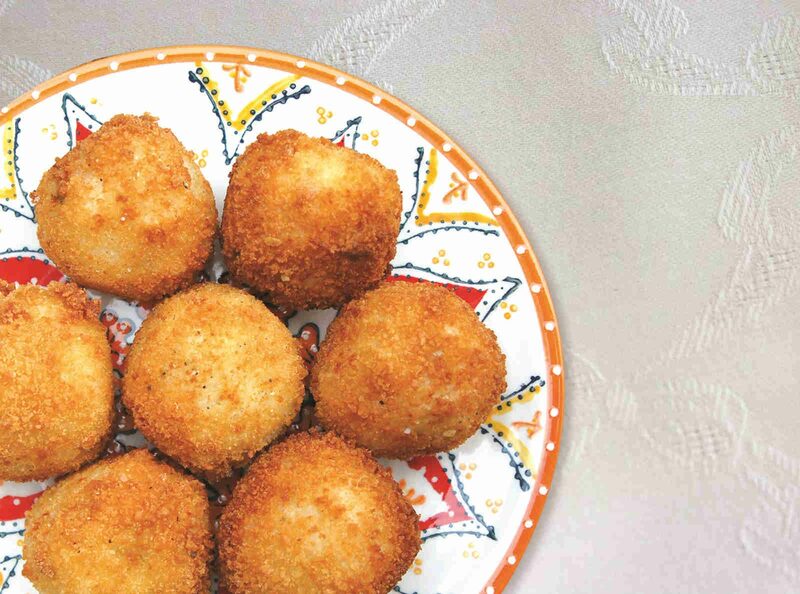 Introduction.These rice balls are the pride of Sicilian cuisine and deliciously encapsulate the island’s history: the Arabs introduced rice seasoned with saffron and meat, it is thought that the breadcrumb coating originated in the court of Frederick II, the French replaced the meat with “ragoût” and the Spanish brought back tomatoes from the Americas to add the finishing touch. Many centuries come together in one culinary delight. You can savour countless exquisite versions in Sicily today. If you would like to make them at home, here is the recipe in three steps. Making the meat sauce. Brown the finely chopped onion, carrot and celery in olive oil over a low heat. Add the beef mince and stir it to break it up, then brown it. Add the tomato sauce, peas, salt and pepper, then continue cooking for around 35 minutes,until the sauce is very thick and almost dry. Leave it to cool, cover it and put it in the refrigerator for a few hours. Making the rice. Boil the rice in salted water until it is nicely “al dente”. As soon as you have drained it, add 50 g of butter, the saffron (which should be dissolved in a little hot water) and the grated cheese, then mix it until it is creamy. Add the beaten egg when the rice is almost cold. Mix it all again thoroughly and pour the rice into a large tray, then leave it to cool completely. Making the arancini. Take the meat sauce, pour the flour and the breadcrumbs into two separate bowls, and beat two eggs in a shallow dish. Put a little rice in your left hand and push down with your finger to make a hole in the middle, then fill it with a spoonful of meat sauce. Use your other hand to cover the top with a similar amount of rice and seal it, making sure the sauce does not leak out as you shape it into a ball. Roll the ball in the flour, then the eggs and finally the breadcrumbs. Repeat until you have used all of the rice. Heat the oil in a chip pan or a deep fat fryer to 170°C-180°C, lower the arancini into the oil and fry them until they are golden brown. Leave them on some kitchen roll to dry, then serve them hot.